Today we announce our new partnership with Gigabyte which will be our second successful association with a major brand of 2017! Gigabyte is a not a stranger when it comes to motherboards. They are the pioneers of this industry and excel in information technology. 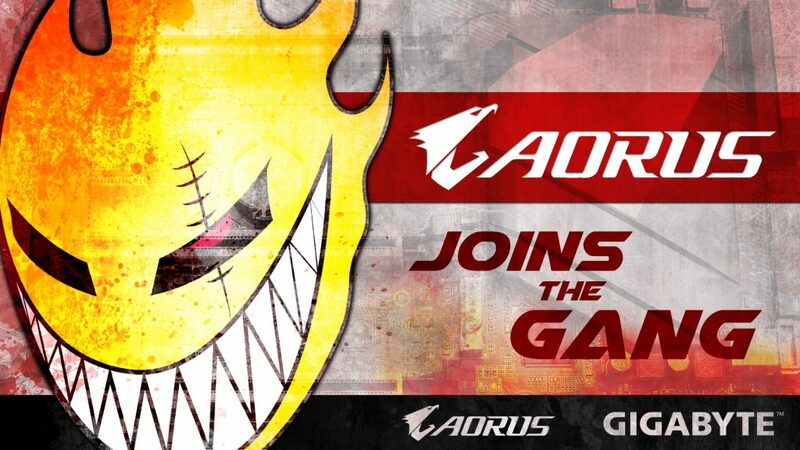 They have also invented Aorus which is their premium gaming brand for gamers who take their games seriously. Aorus, a premium gaming brand powered by GIGABYTE, delivers a full spectrum of gaming products. The entire line of gaming peripherals from the Aorus kitchen is already being loved and served worldwide. With Aorus its definitely your game, your way. “We’re really happy to expand our operations in the gaming industry, with supporting professional gaming teams like Team Brutality. GIGABYTE and Team Brutality share the same values, so it is the perfect partnership. GIGABYTE is No. 1 in the Motherboard industry, and we are pleased to provide Team Brutality with the latest and most innovative high-performance gaming gear available. We can’t wait to see them in action!” –Ginny Hsu, GIGABYTE marketing manager. “I am glad that we got this opportunity to tie up with Gigabyte. Its always a pleasure working with brands who share the same passion towards gaming as you. Gigabyte motherboards have always been on top and are considered to be one of the best in the world. I remember Gigabyte motherboard being my first back in the day when I got my first ever computer. Both of us have evolved since then and have progressed to become better. With the launch of Aorus, its a giant leap from being a household everyone’s motherboard to a gamers weapon of war. The focus of Aorus I feel is towards professional gamers who live and breathe gaming. Their premium line of motherboards have already hit the market with smiles. We at Brutality cannot wait to get our hands on the new line of Aorus motherboards. They surely will be a beautiful addition to our armoury – Ankit Panth, Team Brutality founder. About Aorus – AORUS is a gamer-focused computer company that makes SLI gaming laptops, motherboards, graphics cards, mechanical gaming keyboards, and other gaming peripherals. It is a subsidiary of Gigabyte Technology. AORUS shares the same DNA with gamers who devote their heart and soul to gaming. With AORUS, the pinnacle of our hardware excellence, we are committed to bring a wide array of gaming innovation that delivers ultimate performance and exemplifies the PC’s capability for bringing gamers unprecedented delights. About Brutality – Brutality is an Indian professional Esports organisation that is a registered company with its CSGO squad. Formed by a team of aficionados of CSGO, the team gained recognition in the year 2010 at Chitkara bringing down the Goliaths of the game of that time. Team has just grown since then to become a leading face in the CSGO community in India with their reputation and stature that precedes them. Brutality aspires to become one of the top teams in Asia and represent India and Asia both at the world stage with the same resonance that they and any other pro teams carry. At Brutality we always aim for the best and no matter what the situation is we deliver.